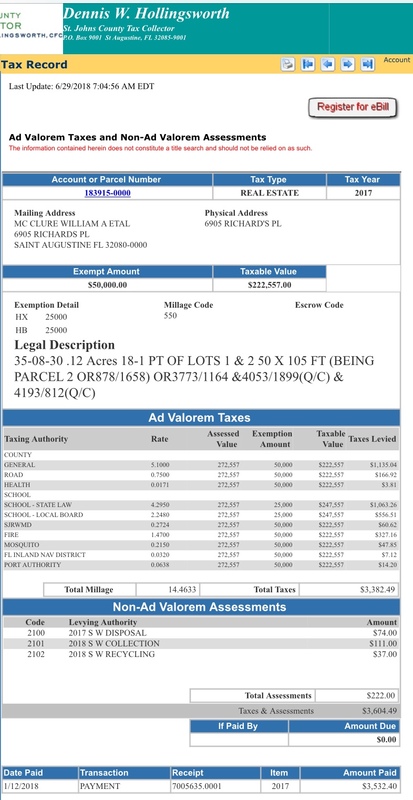 Clean Up City of St. Augustine, Florida: WILL "POLITICAL TOURIST" BILL McCLURE LOSE HOMESTEAD EXEMPTION FOR 5164 Square Foot CRESCENT BEACH MANSION? WILL "POLITICAL TOURIST" BILL McCLURE LOSE HOMESTEAD EXEMPTION FOR 5164 Square Foot CRESCENT BEACH MANSION? Political Tourist WILLIAM ANTHONY McCLURE's has a homestead exemption for a 5164 square foot mansion on Crescent Beach, 10.7 miles (24 minutes) away from the City where he claimed to be a resident on May 31, 2018, when he filed to run for Mayor. 1. Please send me the documents on St. Augustine Mayoral candidate WILLIAM ANTHONY McCLURE's homestead exemption for 6905 Richards Place, 32080, in rural St. Johns County. 2. McCLURE swore under oath that his primary residence is now 105 Marine Street, Apt. 6, in the City of St. Augustine. 3. 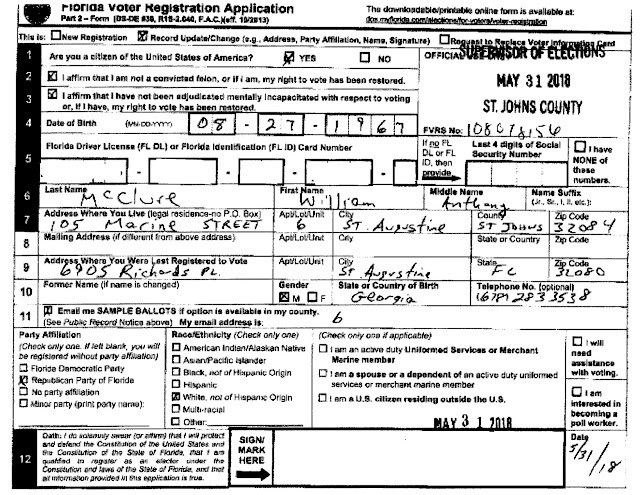 McCLURE swore under oath on his May 31, 2018 voter registration card application that "all information provided in this application is true." 4. Please send me a copy of the USPS change of address card for McCLURE's homestead residence at 6905 Richards Place, when received. 5. Please send me the Property Appraiser document(s) flagging for revocation the homestead exemption for McCLURE's former 6905 Richards Place primary residence. 6. Please see attached three (3) documents from public records of our St. Johns County Property Appraiser, Tax Collector and Supervisor of Elections. Thank you for all that you do.Happy Independence Day! Email disclaimer: This email and any attachments may contain confidential and privileged information and are solely for the use of the intended recipient(s). If you have received this email in error, please notify the sender immediately, and delete the original message. If you are not the intended recipient, please do not use, disclose, disseminate or distribute this email or any information contained in this email. Please be advised that emails are subject to the Florida Public Records Act, and any response to this email may be a public record. This email has been scanned for viruses and malware, and may have been automatically archived by Mimecast Ltd.
1. Thank you for your very prompt response. 2. With my earlier e-mail, I attached BM's voter registration card, dated May 31, 2018. 3. Together with USPS change of address card and driver's license and auto registration change of address information, this should give SJCPA the data you need for future investigations and determinations. The property in question received Homestead Exemption in tax year 2014. The application for the exemption, DR form 501, is confidential. Homestead Exemption is automatically renewed January 1st of each tax year unless the owner provides information to the contrary or our office through the means available to us, find that Homestead Exemption should not be renewed. As you know, for property taxation, Florida is a January 1st lien state. As such, properties are valued and exemptions are granted or denied based upon ownership, use, occupancy and condition as of that date. 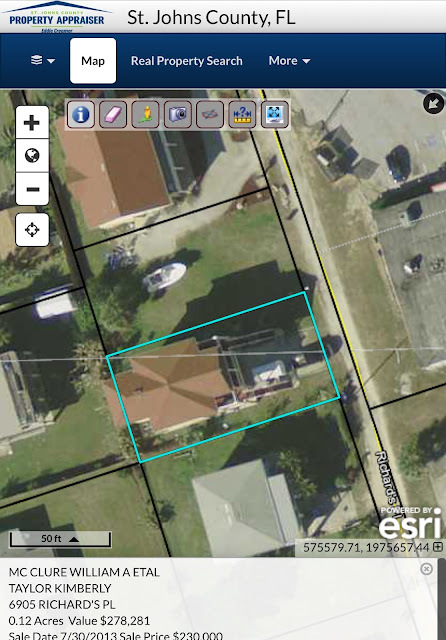 In order to claim Homestead exemption for a particular tax year the owner need only prove that the subject property was owned by the taxpayer and was their primary residence as of January 1st of the tax year and that they or any co-owner do not receive any homestead benefit in Florida or in any other state. To the best of our knowledge and information the owner of this property satisfied these requirements as of January 1, 2018 and therefore is qualified for Homestead Exemption for the tax year. We have no record of change of address for this taxpayer as it relates to this property. As of January 1, 2019, we will reevaluate all exemptions, request additional and updated information as necessary, and renew or deny exemptions based upon ownership, use and occupancy at that time. If I may provide additional information or answer additional questions, please do not hesitate to contact me.